pictures digitaly manipulated wit surreal landscapes, abstract non objective photography. Abstract, non objective, photography. Fluid shapes, floating in the water and wavering in the air. Stunning colors and shades.Pictures for sale. the classical elements: water, air, earth and fire. Abstract and surrealist photography with images rendering their symbolic value. Colors of the nature:In this gallery we can see photos taken during all the seasons: winter, summer, fall and spring. All the subjects are taken from the nature and elaborated by an abstract point of view. the 15 most viewed and sold pictures of photography based digital art. Picture for sale for personal, commercial and editorial use by Bruno Paolo Benedetti photographer. photography based digital art: colors of the nature, fluid floating shapes with many shades,surrealism photography. Pictures for sale for commercial, personal and editorial use. 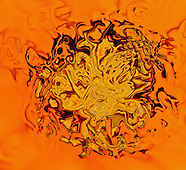 pictures with orange and yellow color as dominant: fluid shapes and shades.